The applied programme will be held at the AUT Millennium precinct in Albany, north of Auckland, on Wednesday 12 September with the support of AUT Millennium and High Performance Sport New Zealand. 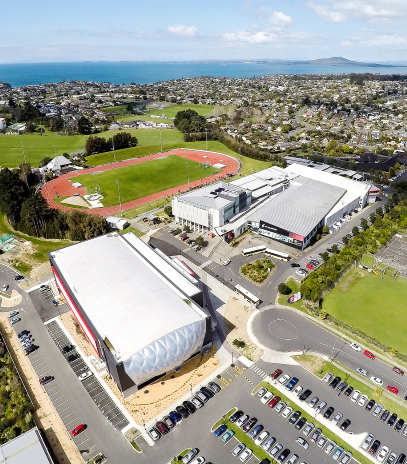 AUT Millennium is the home of SPRINZ and HPSNZ where scientists, elite coaches and athletes work together to improve sport performance and reduce injury risk. The state of the art facilities will be used for the interactive sessions. Industry partners are working with the ISBS 2018 organising committee to help sessions showcase their products in interactive ways with the Olympic athletes, coaches and sport scientists. Each delegate will attend one common session showcasing how we – the scientists, the coaches and the athletes – work together. This will be held in the Sir Owen G Glenn National Aquatic Centre at AUT Millennium upon arrival. Each delegate will then attend two of 14 options applied sessions - chosen during registration (allocated on a first-registered-first confirmed basis - so register early to ensure you get the sessions you want). Buses will leave the city conference Sir Paul Reeves building at 2pm and return after the Sir Graeme Avery Event at 7.30pm. 1. Paralympic Swimming Technique Analysis and Development. Sir Owen G Glenn National Aquatic Centre. A demonstration of a multidisciplinary approach driven by biomechanical analysis for Paralympic swimmers. Dr Jodi Cossor and Matt Ingram will show contrasting approaches to technique optimisation for individual abilities and opportunities. 2. Rowing Stroke Analysis. AUTM Waterpolo pool Ground Level. A practical session delivered by Justin Evans assessing the athletes rowing stroke to assist the coach on technical changes. This session will demonstrate various rowing traits and how the biomechanist and coach can work together to optimise boat speed. 3. Integration Of Biomechanics In The Coaching Of Elite Throwers. AUTM Sports Hall Ground Level - Track side by roller door. This session looks at hammer throwing and the evidence based approach to coaching. The session will be delivered by Mike Schofield who works alongside Athletics NZ coaches, and Kim Hebert-Losier from Waikato University, to develop understanding of performance in a new and refreshing light. Industry partner: Qualysis. 4. Analysis In A Challenging Environment - Sailing. AUTM Sports Hall Ground Level - Weight lifting wall track area. Simon Briscoe and Benjamin Day will demonstrate some of the technologies used on a routine basis for sailing performance analysis in NZ. These include areas such as equipment analysis, coach instrumentation and venue analysis. 5. Athlete Development Biomechanics. AUTM Sports Hall Ground Level - Long jump pit area. Dr Craig Harrison and Prof John Cronin will provide examples from the AUTM Athlete Development programme. 6. Sprinting – Performance and Rehabilitation. AUTM Sports Hall Ground Level - Sprint lanes next to HPSNZ zone. Kim Simperingham who works with high performance rugby athletes will outline sprinting mechanics in practice. The Kistler KiSprint system will also be on display, which is a comprehensive system to analyze, compare and improve sprint starts. 7. Sports Medicine & Biomechanics. HPSNZ Sports Medicine zone. Dr Bruce Hamilton and Prof Duncan Reid will explain and show how the HPSNZ medical support system works in with sports science practitioners for service, education and research to help elite athletes and coaches. 8. Integration Between Inertial Sensors and Motion Capture – Running and Basketball. SPRINZ Running and Cycling Mechanics Clinic Level 1. Kelly Sheerin and Prof Thor Besier will provide examples of using IMU and 3D methods for running biomechanics research, education and service. 9. Cycling Biomechanics. SPRINZ Endurance Performance Clinic Level 1. Dr Rodrigo Bini & Assoc Prof Andrew Kilding will show how linking of biomechanics and physiology improves injury prevention and performance enhancement. The I-Crank system from Sensix will used in this session, which is a comprehensive system to analyze pedal forces. 10. The Impact Of Innovation In Biomechanics. AUTM Small seminar room Level 2. A practical demonstration led by Robert Tang, Andre De Jong and Sean Zhou from HPSNZ showing how new technology and innovation is able to improve the quality of feedback into biomechanics and performance analysis. 11. Wearable Technology In Snow Sports Load Monitoring. AUTM Large seminar room Level 2. Cameron Ross demonstrates the technology being used at the Snow Sports NZ training centre in Cardrona to enhance load monitoring of athletes. This application allows greater insight into training performances and biomechanical loads than has been previously possible in the training environment. Sir Graeme Avery, a founder of AUT Millennium, will attend the Sir Graeme Avery Wine & Cheese Event following the AUT Millennium Applied Sessions. Buses will transport delegates from the city centre to the venue and back. Simon and his wife Dani immigrated to NZ in 2013 in order to commence his role as a Senior Performance and Technique analyst with sailing. Since then he has become the head of the PTA discipline within HPSNZ. After graduating from Southampton University with an MEng in Mechanical Engineering, Simon worked briefly for the Jordan Formula 1 team as a vehicle dynamicist before joining the engine development team at Ford Motor Company for 5 years. Simon then returned to his passion of sailing, working with the British Sailing team for 2 Olympic cycles including the highly successful 2012 Olympic Games. The New Zealand sailing team have benefited from this experience with Simon and Ben Day analysing race data on international events, enhancing boat and sail technology, as well as introducing new technology for coaches to provide real time feedback to their athletes. Jodi started her career under the guidance of Dr. Bruce Mason at the Australian Institute of Sport where she worked for five years predominantly with the Swimming and Water polo teams. In 2002 she moved to England to be the first biomechanist to be employed by British Swimming. During this time, she introduced competition analysis to determine race strategies that could then be practiced within the daily training environment. Whilst working for British Swimming Jodi completed her PhD on the use of technology to improve the performance of starts and turns in swimming. After 3 Olympic cycles Jodi moved to New Zealand in 2013 where she is currently a Senior Biomechanist for the Swimming and Paralympic Swimming teams. Kim has nearly 20 years of experience as a Strength and Conditioning coach supporting a wide range of sports. He is currently the National Training Centre (Auckland) S&C Manager for High Performance Sport New Zealand, Yachting New Zealand S&C Lead, the All Blacks sport scientist and also works with shot putter Valerie Adams. Kim was formerly head of S&C for Auckland Rugby, NZ Blacks Ferns and Kintetsu Rugby (Japan). Kim is a PhD candidate at AUT University and his research interests include enhancing sprint performance in team sport athletes; the effect of wearable resistance on sport training and performance; and acute enhancement of power performance. After completing a BSc in Physics followed by a MSc in Sports Science, Justin commenced work with Cycling New Zealand for the Rio Olympic cycle as a performance scientist. In 2017 Justin was employed by High Performance Sport NZ to support Rowing NZ in both biomechanics and physiology. This work includes monitoring each training session for all athletes through the use of heart rate and boat/stroke measurements. Justin’s work with the rowers has involved collaboration with the Goldmine team to enhance real time feedback tools for both the coaches and athletes. Bruce has been the Director of the Performance Health team based at the National Training Centre in Auckland since 2013. He is also the Head of Sports Medicine for the NZ Olympic Committee and the Medical Director of Canoe Racing NZ and is a practicing Sports Physician who recently completed his Doctorate in Sports Medicine. Past roles include Sports Physician for the Australian Institute of Sport, Medical Coordinator for Athletics Australia, Team Doctor for Triathlon Australia, Regional Lead Physician for the English Institute of Sport and Chief Medical Officer for UK Athletics. Before moving back to his country of birth, Bruce worked for three years at the purpose built facility of Aspetar, Qatar Orthopaedic and Sports Medicine Hospital as the Chief of Sports Medicine.